Polyurethane (PUR) is characterized by its longevity, versatility and dimensional stability. Due to its positive characteristics, this plastics is suitable for various application areas: from construction to foams for furniture and bedding, in transportation as well as in the production of paints, coatings, adhesives and sealants. In 2014, a worldwide turnover of US$ 50 billion was achieved with PUR. The market research institute Ceresana expects annual revenues to increase by 4.8% p.a. to approximately US$ 74 billion until 2022. A significant influencing factor for the PUR production is the increasing focus on energy efficiency. Reasons therefore are the climate change, the increasing mobility and the necessity for conserving of resources. Especially in the segment of construction, which is the largest application area of Polyurethane, this leads to an increased use as insulation. Here, the country specific measurements of government aid for an increase in energy efficiency is a major influencing factor. Ceresana expects that globally, the demand in the construction segment will rise by 4.6% p.a. in the future. In order to create a full transparency of the PUR market, the analysts of Ceresana examined the two primary products methylene diphenyl diisocyanate (MDI) and toluene diisocyanate (TDI) as well. Due to the different application areas of TDI and MDI based PUR, the demand for PUR, MDI, and TDI will be split by respective applications in detail. MDI based PUR generated almost 55% of the annual PUR demand in 2014. Additionally, its annual growth of 4.2% will be above the one of TDI. This is a result of the positive development of the construction industry where MDI based PUR is dominant and the weaker development of furniture and bedding which is the most important sales market for TDI. Chapter 1 is a description and analysis of the global PUR market. Development of demand, revenues, and production are explained in detail. Demand will be split by MDI and TDI based polyurethane. This report offers a comprehensive overview over development expected for 20 individual countries and 7 regions as well as global market dynamics. Additionally, demand for the isocyanates MDI and TDI as well as their present and prospective capacities are taken into consideration. 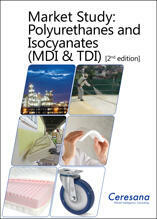 Chapter 2 examines the 20 largest countries of the market in more detail: Detailed information is given regarding demand, revenues, production, trade, and demand for isocyanates. Demand for PUR, MDI, and TDI is analyzed explicitly and is split by respective areas of application in detail. Chapter 3: The areas of application of PUR are analyzed in detail: Data on demand development is split by the 7 regions Western Europe, Eastern Europe, North America, South America, Asia-Pacific, the Middle East, and Africa. Also, consumption figures for the 20 most important countries in each region will be given. Included in the considered application areas are construction, furniture/bedding, transportation, paints & coatings, adhesives & sealants, other applications (rubber, leisure and sports goods, electrics and electronics, textiles, packaging).